There’s a ton of great info packed into this guest post from the Danforth renewal dynamic duo, Tina & Gay. Read on for all the exciting changes the team has been working on to improve the ‘hood. Whether you shop local, work local, eat local or pitch in to lend a hand on renewal projects, you’re supporting the revitalization of our commercial strip. We all get stoked when new businesses open and DECA and WoodGreen are excited to continue renewal efforts on the Danforth! There’s lots going on and we’re grateful for funding support from the Metcalf Foundation as we head into year 2. 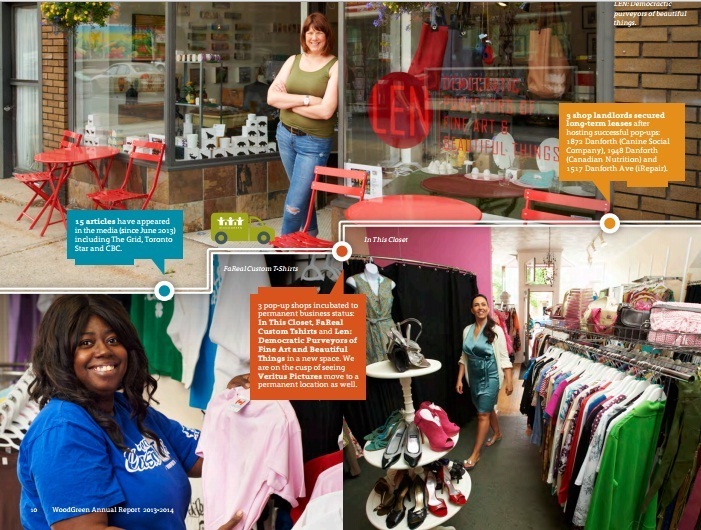 Pop-up successes looking fabulous in WoodGreen’s annual report. Change like this happens through the incredible work and dedication of local volunteers. Thank you! There’s a new BIA marketing committee, and in September local businesses and residents were invited to contribute their vision of the area. Over 30 people came together during three sessions to participate in a range of activities designed to help define the area. 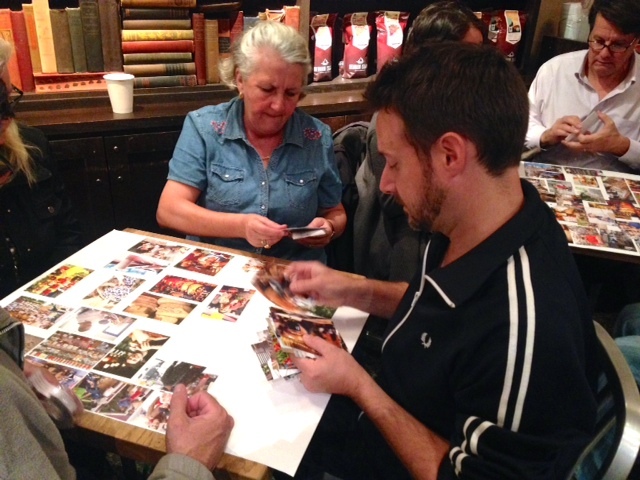 Participants shared their thoughts, used pictures, and tested their artistic skills to envision what the Danforth could be. This was the first step to generate input for the BIA’s new marketing plan to put the area on the map! Keep your eyes peeled in the coming months! A BIA marketing consultation session. 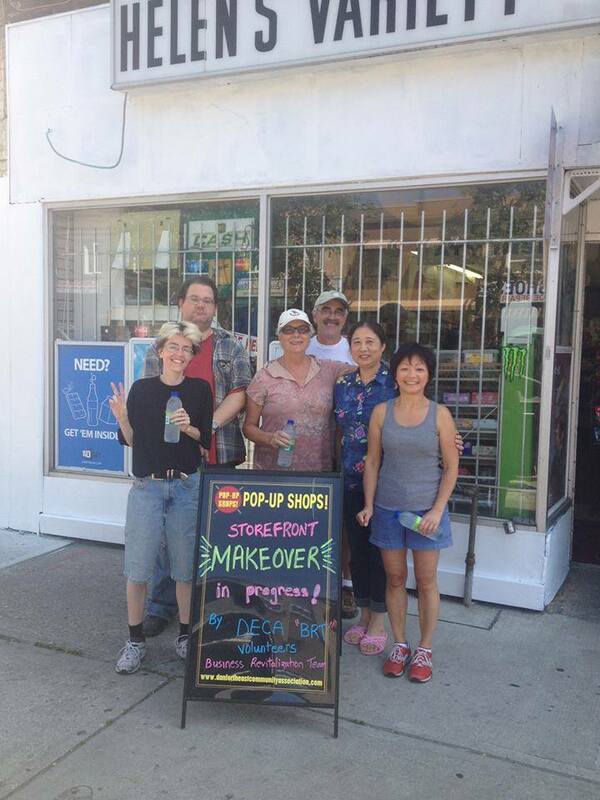 In August, DECA’s Business Revitalization Team (BRT) created a splash on the Danforth with another storefront makeover! Helen’s variety store (1781 Danforth Avenue) was transformed from the old shabby, faded blue façade to a clean, bright new look featuring yellow and white stripes. How does something like this happen?! Needless to say, it’s a lot of work. It takes the passion of a team lead (Pat Young) and the talent of many volunteers to design, research, consult, promote and then implement this brand new look! Why Helen’s Variety? Watch this one minute video to find out. BEFORE: Helen’s Variety’s awesome make-over team. AFTER: owner Tom poses with the new & improved Helen’s. architect Michelle Senayah. City Councillor Janet Davis pitched in, connecting DECA/WoodGreen to the TTC and Green P Parking Authority. 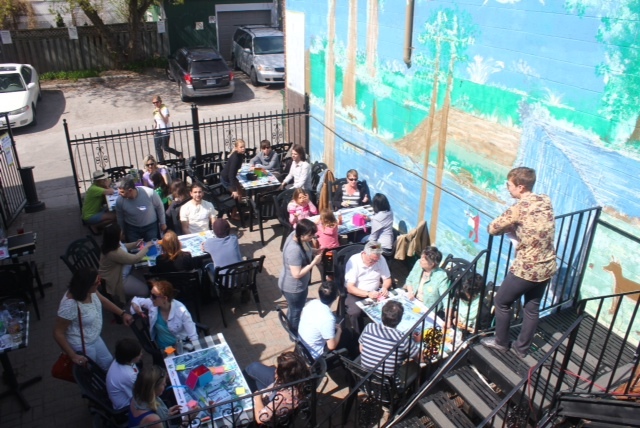 Over 20 people attended the consultation held adjacent to the laneways, on TKOS’ patio.Fast forward to September and we are delighted to report that everyone’s dreams and ideas to improve the laneways are closer to becoming a reality! Things like murals, better lighting, signage and wayfinding, and more attractive fencing, were on the table at a meeting convened by Councillor Janet Davis. Representatives from the TTC, Transportation Service, the Public Realm at the City, Green P Parking Authority, DECA, WoodGreen and East End Arts are working together to find ways to move forward. Teamwork takes time and there are no guarantees; still it’s awesome to know that improvements are coming. We’ll keep you posted! The Reimagining Coxwell station laneway session.